“Better to light the candle than curse the darkness,” as old Chinese proverbs would say. Zoominations is a Chinese event of light lanterns that are held over the world in major cities and countries, which include London, Beijing and even Toronto. 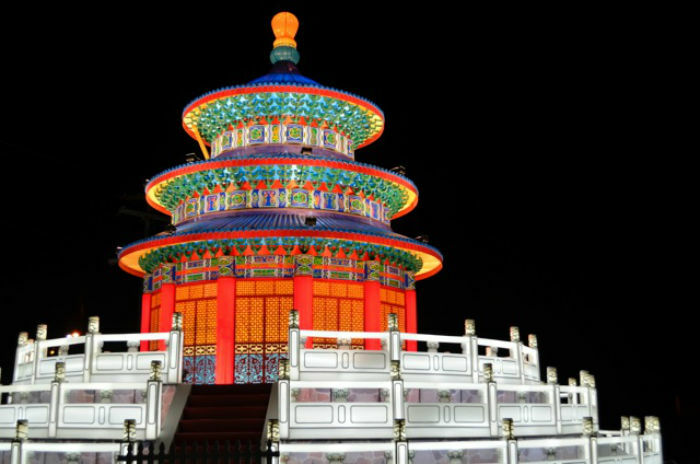 This light show takes a cultural turn in showing the spectacular works of Chinese lanterns. During the month of April, this event was featured at Lowry Park Zoo and has been extended through June 28, so get your tickets fast. 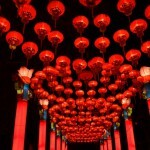 Lanterns have been a part of the Chinese culture for many dynasties and are considered great art. 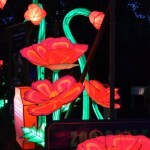 These great pieces of work are used at festivals, and now park goers get to experience the overseas light show. These lanterns are constructed of many modern Chinese objects, including light bulbs full of color, silk, and porcelain dinnerware, which took a long time to put together. Before any great technology was about, the festivals did not have everything that this lantern show has to offer. Zoominations has things like music and visual effects just to make this cultural experience modern. As you first walk in, you are greeted with some of Chinese history right off the bat. A beautiful glowing red tower gives the audience a taste of what lies ahead. “There are two kinds of light- the glare that illuminates and the glare that obscures,” as said by James Thurber. Zoominations had all sorts of glares all that were used to obscure. 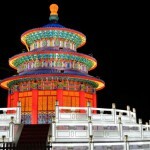 For example, walking into the park, there is a huge pagoda. 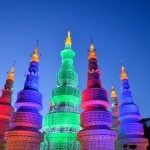 Pagoda’s were built for Buddhist monks, but this pagoda is made up of over 68,000 porcelain plates, spoon bowls, and cups and is about 52 feet in height! Another interesting sculpture is the huge dragon made up of nothing but medicine glasses and filled with colored die, which is held together by string and is very fascinating. Although this light show does have your traditional paper lanterns, these were made up of some crazy obscure objects and took over three days just to set up. Another great example would be the peonies. Peonies are the national flower of China, and the Chinese believe they bring great prosperity and have nobility. Everything on display shows the audience a bit of Chinese culture. These bright, huge purple flowers light up the pathway into the next structure. This place was set up really nice and told a story as you walked through – the story of China’s greatest architecture and art. The music was also a plus. It was calming and each lantern shown has its own sound, giving the viewers an all over experience. The music is traditional Chinese music, making you feel like you’re actually at a festival in China. 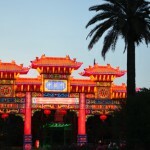 Some may have been to Disney’s Epcot and seen the great works of China there, but it can’t compare to the beauty of this light show at the humble Lowry Park Zoo in Tampa. The only down side to the experience are some of the farm-like smells from the zoo. “You can’t have light without a dark to stick in it,” Cornelius Celsus once said. 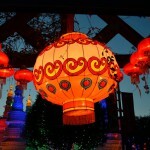 This lantern show is best seen in the dark, so get there a little later than normal. Start driving right before sunset because these lanterns have the best pay off when you’re wandering and pondering at night. No worries about “selfie” lighting; there is enough light for that! 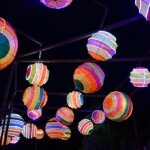 These lanterns may be packed with culture, but there’s more! Every few hours or so, there is a live show that’s set up on a stage. This show includes a guy on a unicycle doing incomparable tricks as well as some traditional Chinese banner dances by two lovely girls. The show is both endearing and profoundly entertaining. Some special nights will include authentic food. Right next to the main stage are kiosks filled with Chinese banners, beads, and artwork. Here you can engrave names using some more obscure things, such as rice. Banners can be custom made right in front of your eyes. Most of the tassels and beaded bracelets are all handmade and stand for something. Some bracelets you can wish upon, and when you wear it, it’ll come true! The tassels are all handmade with special colors that stand for something significant in the Chinese culture. “The red represents having or to be filled with prosperity, while the yellow represents royalty; that’s why we value those colors in China so much,” one of the workers explained. She also stated that in Chinese culture, men were once allowed to have many wives. However, only the first wife was allowed to wear red as a sign of royalty. Some tassels granted great luck in success, fortune, and relationships. Plus, they were very elegant and pretty, and not a bad price at all. All in all what more could you want? It’s a great price and a great experience. If you want to experience the move Avatar in real life, you have come to the right place! The environment really does replicate that movie in a sense that it’s so magical, just like a science fiction film. It is a magical, calming experience that ignites all sorts of feeling at once in just one night; or two if you decide to go again! 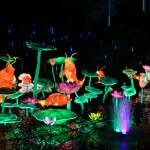 Zoominations really does incorporate the Chinese culture in such an honored and grand way. It’s a great learning experience that’s great for all ages!